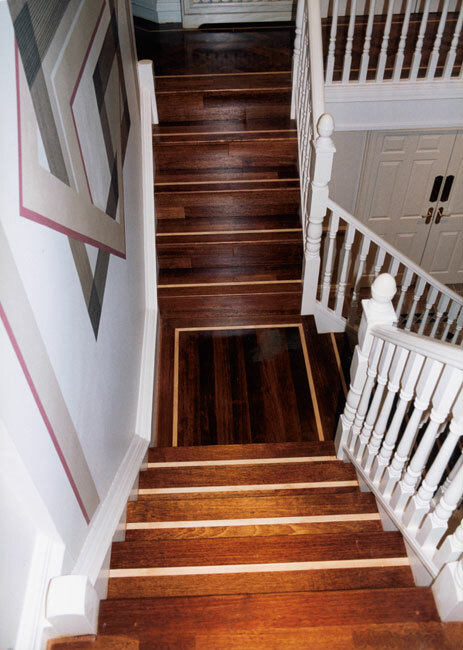 A solid hardwood floor can be successfully installed in most situations, whether over existing floorboards or over solid floors such as concrete or mastic asphalt. Where there are more extreme conditions, such as in conservatories / sun rooms, unheated rooms, bathrooms, or in areas with underfloor heating, a wood floor can be installed, but there will be special considerations, which I would discuss with the customer. Installation of the new floor directly over joists is not recommended, as the standard spacing of joists in houses is too large for a satisfactory result. It is much better to install the floor onto existing floorboards, or to install a base of 18 mm exterior ply. Where the sub-floor is concrete, a base of 18 mm ply can be fixed down, onto which the new floor can be secret nailed, or special adhesives can be used to fix the new floor in place. Mastic asphalt is an unsuitable sub-floor to accept a wood floor fixed with adhesive, but it can either be replaced with 18mm ply or 18mm ply can be fixed over the top of the mastic (with screw fixings through the mastic into the concrete beneath) to provide a suitable base for gluing or nailing a wood floor. Concrete floors in new-build houses will take many months to dry out completely (a rule of thumb is one month for each inch thickness of the slab), but to save delays the concrete can be sealed with a surface damp proof barrier, to enable installation to proceed. In all our installations we work to any relevant provisions of BS8201 (2011). Wood floors can be successfully installed over underfloor heating (UFH), but only if the heat output of the UFH will not need to exceed the maximum safe limit of 75 watts per sq. m. under any conditions. It is also not true that engineered board is safe with UFH – it will fail just as readily as a solid wood floor will if the heat output is too high. We have a separate information sheet on UFH and wood flooring, available on request, and always provided with any estimate involving UFH. A gap for expansion must be left all around the edge of the floor, and it can be concealed with a moulding in the same timber as the floor, or alternatively the skirting boards can be removed before installation and then replaced on top of the new floor. 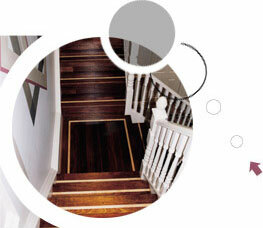 If desired, new skirting boards in the same timber as the floor can be supplied and fitted. Decorative borders can be considered, either for individual features, such as fireplaces, or for the entire floor. These are strongly recommended where an exterior door opens onto the new floor, and in domestic situations coir matting is usually installed in the well. They can be of any shape or size. Where the new floor meets other floorcoverings there are different methods of covering the junction, ranging through metal cover plates (in brass, chrome, stainless steel, etc) to cork strip or hardwood thresholds.